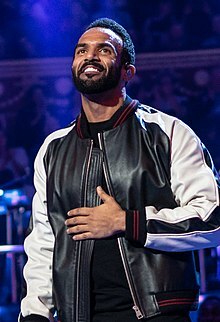 Craig David (born 5 May 1981 in Southampton) is a British pop singer. He rose to fame as the singer on the Artful Dodger's Rewind which reached number two in late 1999. In 2000 he had number one hits with Fill me in and 7 days. At the end of that year he was named best UK newcomer and best R&B act at the MOBO Awards. His albums Born to do it and Slicker than your average were released in 2001 and 2002 respectively. David has been nominated for thirteen Brit Awards. He was nominated four times for Best British Male, and twice received a Grammy Award nomination for Best Male Pop Vocal Performance. ↑ "BRITs Profile: Craig David". Brits.co.uk. Archived from the original on 27 June 2014. Retrieved 22 September 2014. ↑ "Awards & Features: Craig David". Metrolyrics.com. Retrieved 22 September 2014. ↑ Babatunde (2010-03-19). "Craig David: The Interview!". MTV. Archived from the original Archived 11 October 2010 at the Wayback Machine on 2010-10-11. Retrieved 2012-06-05. This page was last changed on 21 February 2019, at 23:29.